How smooth is the Sun? The new Swedish 1-m Solar Telescope, deployed in the Canary Islands only last year, allows imaging of objects less than 100-km across on the Sun's surface. When pointed toward the Sun's edge, surface objects now begin to block each other, indicating true three-dimensional information. 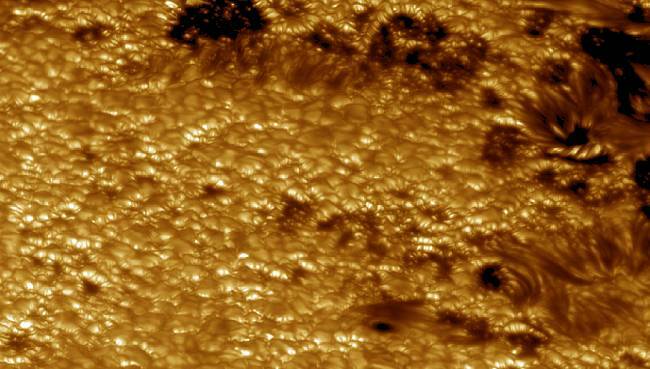 Close inspection of the image reveals much vertical information, including spectacular light-bridges rising nearly 500-km above the floor of sunspots near the top of the image. Also visible in the above false-color image are hundreds of bubbling granules, each about 1000-km across, and small bright regions known as faculas. Max Lambertini, xxyxxyart, Rifkin Semmelweis, antifa seal division, 𝔠𝔞𝔰𝔢𝔶 𝖙𝖆𝖐𝖊𝖓 𝖇𝖞 𝖆 𝖋𝖊𝖞 𝖒𝖔𝖔𝖉, lis, alyxmaia and Jinny Seesaw like this. David Thiery, Isaac Kuo, xxyxxyart and Jinny Seesaw like this.